Item No. E-105* -- Ultimate Naturals Goat's Milk Lotion* (formerly Ultimate Willard's Water Lotion with Goat's Milk). People who have used this Lotion have loved how smooth it is with no greasiness to it, and no fragrance but also no “hospital like” or “cleaner chemicals” type smell. And, they love how it seems to instantly soften the skin. Item No. 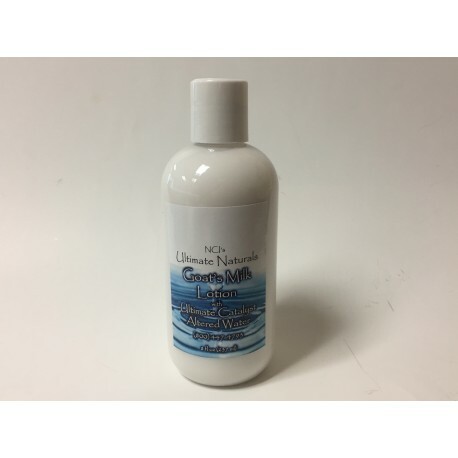 E-105* -- Ultimate Naturals Goat's Milk Lotion with Ultimate Catalyst Altered Water* (formerly Ultimate Willard's Water Lotion with Goat's Milk). Regarding the name change -- the soap is exactly the same as before but with a new name and label. For more information on the name change, go to PAGE 5 of our June/July 2018 Newsletter. If you’re reading this, you’re probably aware of Ultimate Catalyst Altered Water's legendarily positive impact on skin. Well, imagine that legendary-for–the-skin product, combined with Goat’s Milk, and some other amazing items, and you may get an inkling of how great this is. First, there’s nothing harmful in it. Even eating it wouldn’t hurt a person. Though as always tell children (and adults!) NOT to eat lotions, soaps, etc. — especially since many of them could be harmful. -- Many report improvements in their skin condition. Ingredients in Ultimate Naturals Goat’s Milk Lotion: Ultimate Catalyst Altered Water, Goat's Milk, Aloe Vera, Sunflower Oil, Jojoba Oil, Meadowfoam Oil, stearic acid, soya oil, cetyl alcohol, emulsifying wax, veg. glycerine, palmitic acid, tocopheral, potassium sorbate, vitamin C, citric acid, Germall Plus.